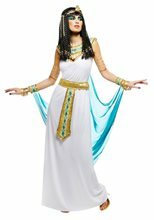 Queen of the Nile Plus Size Costume.Includes: Split front satin Cleopatra costume gown, sequin belt with attached puff print apron, puff print collar plus sequin and jeweled headpiece. Available Size: Plus Size - XXLarge. (See Size Chart For More Information) *Shoes Not Included. Accessories Sold Separately.This Plus Size Deluxe Queen of the Nile Cleopatra Costume includes the split front satin Cleopatra costume gown, sequin belt with attached puff print apron, puff print collar plus sequin and jeweled headpiece. 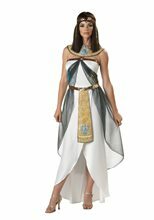 Queen of the Nile Adult Costume.Includes: Split front satin gown, sequin belt with attached puff print apron, puff print collar plus sequin and jeweled headpiece.Available Size: Womens - Medium, Womens - Large, Womens - XLarge. (See Size Chart For More Information) *Shoes and Other Accessories Not Included. Sold Separately.Features split front satin gown, sequin belt with attached puff print apron, puff print collar plus sequin and jeweled headpiece.